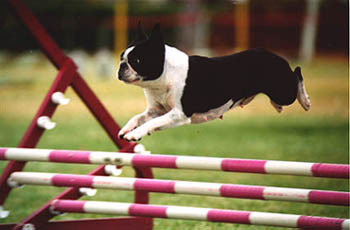 Brit-Brit, our cute "Pickle-puss," you were the most beautiful Boston Terrier puppy ever seen--like a figurine, so perfect in every way. In fact, you knew it! You were born to show or show off! You believed your very presence was enough! 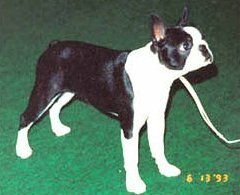 In the conformation ring you were spectacular, even as a 4-month old puppy winning Best in Match (Pasadena Boston Terrier Club). You finished your Championship at 10 months of age. The Golden Gate Specialty was an auspicious occasion when you won Best of Winners (5-point major) under Judge Ethel Braunstein who borrowed you to show spectators the ultimate in showmanship. Because of you, Brit, an observer told me she now knew the reason for coming that day: to see me handle you in the ring! You were magnificent! After your Championship, you became Bruce's agility partner when I told him "You spoiled her; you show her!" You consistently Qualified and Titled with multiple lst, 2nd and 3rd placements. Such was the case February 27 and 28, 1999, at a NADAC trial: you and Bruce Qualified 3 out of 4 runs first day to receive your Open Jumpers title and Qualified 4 out of 4 runs second day to receive your Elite Jumpers title. 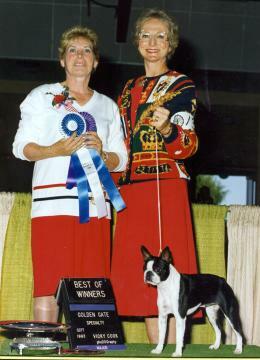 Your dual career had its heyday at the Boston Terrier Club of America National, Pomona, CA, 2000, in the Parade of Champions. During your victory lap, Bruce had to inform the baffled MC and audience of what was AX AXJ. You were not just another pretty face, you were an athlete, a performance dog! Dearest Britches, you were, are and always will be the most beautiful. You are much loved and unforgettable. . . daddy's girl.